Meatloaf is one of Andrew’s favorite meals. In fact, I recently asked him if he’d like to have Mondays be “Meatloaf Monday” and he loved the idea. I’m afraid he’ll get bored with it, but so far it’s making Monday meal planning easy peasy. 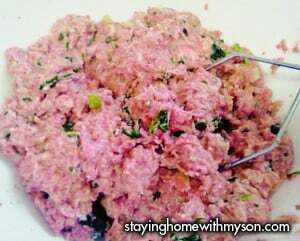 I think I might vary it a bit by making meatballs instead once in a while though, another one of his faves. I was recently searching the internet for meatloaf recipes looking for new ideas, and also because I always forget how high and for how long. I also was wanting to know if there were any tried and true efforts at making meatloaf in a slow cooker. This recipe is a result of that search. It came out so good using the slow cooker, and I didn’t have to heat up my kitchen. I love it anytime I can use my slow cooker instead of the oven anyway. 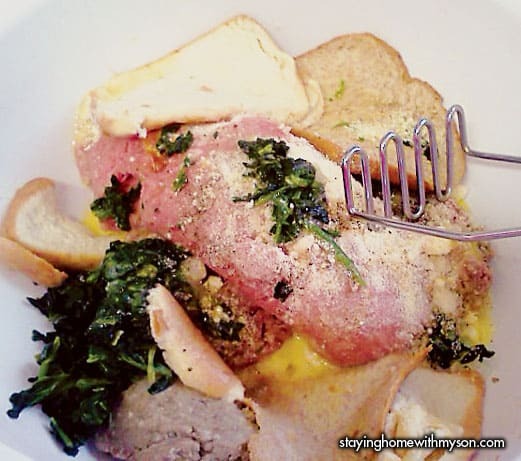 This quickly became one of my favorite slow cooker recipes. All the ingredients in one bowl. I doubled the recipe and used half ground beef and half ground turkey. Mostly because I had ground turkey given to me and didn’t know what else to do with it. And meatloaf leftovers are always a good time. See the potato masher? Does an excellent job of mixing up the ingredients. All the ingredients mixed up. See how the potato masher does a smashing job of mixing? And no need to get one’s hands all gross. And especially no need to spend the next several hours picking raw hamburger from underneath your fingernails. I do use my hands to shape the loaf, but it’s much more manageable to clean up after if I use the potato masher. Tah Dah! The finished meatloaf. It is so yummy. Of course, as I’ve said before, I’m blessed to have a child who isn’t a picky eater. But still, it’s quite tasty. Basically I’ve taken Pioneer Woman’s meatloaf recipe and gave it my own twist. Adding and subtracting based on personal preference and ingredients normally available in my kitchen. One change is where Pioneer Woman uses Tabasco sauce, I use Sriracha. I heard Rachael Ray say once that adding spicy deli mustard is her “secret” ingredient in a lot of dishes. I love spicy deli mustard, and I followed her lead for a while. Then I discovered Sriracha. I usually use it in place of hot sauce or other spicy ingredients in most recipes with great success. It is quickly becoming my secret ingredient. Also, I mention lining your baking sheet or slow cooker with aluminum foil. I’ve been using the Reynolds Wrapper Pre Cut Pop-up Foil Sheets. They are the perfect size for my baking sheet as well as my slow cooker. They make clean up easier, and transfer the meatloaf out of the crockpot easier than if I used nothing. If cooking in the oven, pre-heat oven to 350 degrees. Pour milk over bread slices in a small bowl. Set aside to soak. In a larger bowl, add all other ingredients through beaten eggs. Mix well. Either with your hands or a potato masher like I did. Line crockpot or baking sheet with aluminum foil. If cooking in the oven, form loaf on the aluminum foil. Spread sauce over loaf. Cook in 350 degree oven for about an hour. Depending on preference, you can use half to three quarters of the sauce now, and spread the last of the sauce 10 to 15 minutes before the meatloaf is done cooking. 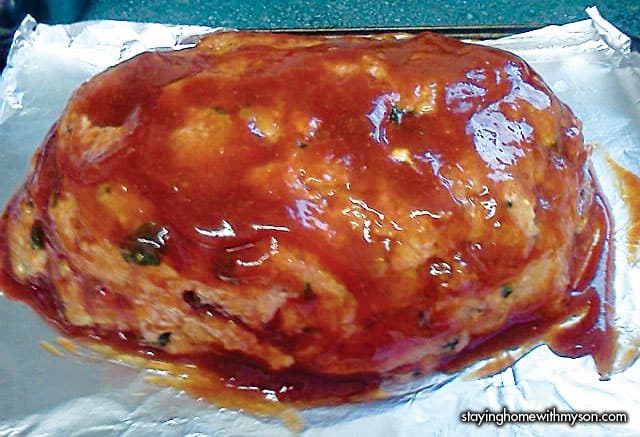 If cooking in the slow cooker, form loaf on the aluminum foil in the slow cooker. Spread sauce over loaf. Cook on low for 6-8 hours, or high for 3-4 hours. I usually transfer the meatloaf from the crockpot to a baking sheet and stick it in the oven for about 15 minutes to give it that baked texture and look on the outside. I just grab a opposite corners of the foil and lift it out and place it on the baking sheet. Cook time: 6-8 hours if using slow cooker. This post and photos were inspired by the Cook Easy Foodie Blogger Challenge being held by Once a Week Cooking. sounds great. I was wondering whether or not to try the Meatloaf recipe in the Slow Cooker so you answered my question. I came across a great recipe in BHG Skinny Slow Cooker magazine for January. Also the correct spelling is Siracha. I love making meatloaf in the slow cooker! I’m glad it helped you decide to try it. 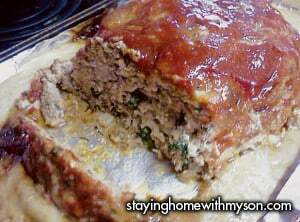 Be sure to stop back by and let me know how you like meatloaf in the slow cooker.